New York, NY: April 12, 2011 The Spring Corporate Lunch hosted by the Ireland-U.S. Council to be held Friday, April 29 at Dublin’s Four Seasons Hotel will feature a powerful double-bill Guest Speaker platform. Ireland’s Minister for Finance, Michael Noonan, TD will address the group. Also appearing at the speaker’s podium at the Council lunch will be U.S. Congressman Richard Neal, who is among the staunchest of Ireland’s friends in the U.S. Congress. The Ireland-U.S. Council was founded in 1963 by business leaders in America and Ireland. A principal objective is to encourage business links between America and Ireland, North & South. In pursuit of its mission, the Council, among other activities, operates scholarship and internship programs, undertakes various publishing initiatives and frequently hosts seminar platforms and other business-oriented events in Ireland and in America. Michael Noonan is Ireland’s new Minister for Finance, having been appointed to the post following his party’s success in the recent General Election. He has represented Limerick East and later Limerick City in Ireland’s Parliament (D_il _ireann) since 1981. He has been a minister in every Fine Gael-led government since 1982, serving in the cabinets of Garret FitzGerald, John Bruton and, now, Enda Kenny. During these terms of office he held the positions of Minister for Justice, Minister for Industry and Commerce and Minister for Health. Also appearing at the speaker’s podium at the Council lunch will be the noted American legislator, Congressman Richard E. Neal who represents the Second District of Massachusetts in the House of Representatives in the United States Congress. He was born in Worcester, Massachusetts and was raised and educated in the City of Springfield. Congressman Neal was first elected to the United States House of Representatives in 1988. The Second District of Massachusetts includes cities and towns in western and central Massachusetts. He is a member of the powerful Ways and Means Committee and the Ranking Member of the Subcommittee on Select Revenue Measures. He is a graduate of American International College, where he received his Bachelor's Degree in Political Science and received his Masters Degree in Public Administration from the Barney School of Business and Public Administration at the University of Hartford in 1976. 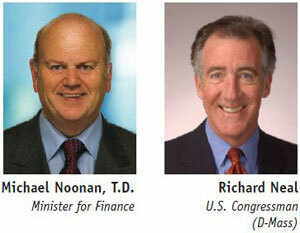 Congressman Neal serves as the Democratic Leader of the Friends of Ireland in the U.S. Congress. In 2002, Congressman Neal received the International Leadership Award by the American Ireland Fund for his work over two decades to bring peace and reconciliation to the island of Ireland. The President of the Council in New York, Dennis D. Swanson said "The Council is delighted to host a luncheon with two such important speakers. As Minister for Finance, Michael Noonan has taken over a crucial portfolio in Ireland’s Government at a most challenging time. We look forward with interest to hearing his remarks." He added "We are also very pleased to welcome such a distinguished representative as Congressman Richie Neal from the United States who is such a great friend of Ireland and is so knowledgeable on Ireland-U.S. relations."